One of the most popular techniques for plotting a tie-in novel is to fill in back story. Star Wars did it with the novel Death Star…until it was completely removed from canon by Rogue One. Star Trek did it with The Eugenics Wars novels…until they were completely removed from canon with the Khan comics miniseries. Underworld did it with the novel Blood Enemy…until it was removed from canon by Rise of the Lycans. OK, so this happens to be a big hazard of tie-ins. Whatever canon goes into one gets rewritten at the first opportunity. This brings us to today’s column. In 1997-1998, we got the full back story for Han Solo in The Han Solo Trilogy. It was the canonical origin for the smuggler through the days of the Expanded Universe…until Disney officially declared the EU non-canon. In May, we got an official origin in the form of Solo: A Star Wars Story, thus officially killing the trilogy in canon. But that’s not how it really works. The books aren’t gone. There’s nothing that’s been eradicated on our shelves. Why can’t we hold onto the Han Solo Trilogy as a backstory? We can. So let’s lay out the parallels between the two and decide which counts. The background for Han is remarkably similar in both. He’s an orphan working for a Corellian gang leader. The difference is in the books it’s a human named Garris Shrike. In the movie it’s a Linda Hunt voiced centipede named Lady Proxima. The one big change is in the books Han knows his last name while he’s given it at random in the film. The differences are small but the books win because I like the idea of Han learning his trade from someone not unlike who he became. A dark Han is interesting. A very cool effect isn’t. There has to be a girl in Han’s past. Well there has to be because the logical person to fill that role is a no go because of homophobia. So since Lando can’t be this person (though he is), let’s look at the inevitable love interest destined to exit the story. The novels give us Bria Tharen, drug addicted pilgrim turned Rebel leader. She is an all powerful, all consuming figure. The movie gives us Q’ira, a crime lord who seems to be in love with Han but betrays him all the same. Two extremes here. Frankly I prefer the latter. Star Wars has too few villains and though there’s not much to the character, she’s an interesting idea, someone who sours Han on love. Bria is too much. Han meeting Chewbacca and getting a life debt from him is THE moment we wait for. It’s pretty good in both. In the novel it’s just offscreen as he saves Chewbacca from imperial slavery. In the movie, he’s sacrificed to Chewbacca and talks him into helping him escape, earning a friend til death. I love both and both work, but Han scheming with Chewie to get free feels just a bit more right. Close but one more point for Solo. As I stressed, my headcanon won’t accept that Han and Lando weren’t lovers. They act that way on Cloud City. So this comes down to which sells me that they were close. It’s the novels hands down. In Solo they barely seem to like each other even in the least while there’s a nice chemistry between them in the books. As for the Falcon win, it’s less of a clever gambit–Han stops Lando from cheating in the movie and thus takes the Falcon–and a normal win in the books which is less fun but not boring either. Han needs rivals. The movie gives us two rounds with Enfys Nest and their team of marauders followed by the eventual emergence of Crimson Dawn, led first by the generic crime lord Dryden Vos and eventually revealed to be led by, um, someone based on previous live action evidence you wouldn’t expect to see again. The books give us Shrike, the leaders of a cult Han faces off with, and most importantly the Hutts. Frankly there’s not much of a win here either way. But Solo wins it because I felt the threats were better and I love the character I can’t name. How did Han prove the greatness of the Falcon? The Kessel Run is weirdly tossed off in the books. He makes it several times and the last time he realizes he made it in the shortest amount of time. In the movie, it’s a huge, life or death deal. It results in one of the definitive Star Wars scenes. This chase is epic defined. Now we come to the big question: which one sets up Han Solo the best? This isn’t as easy as you’d think. Yes, the movie was cowritten by the man who gave Han his voice, Lawrence Kasdan. But the late Ann Crispin was no slouch, especially at prequel novels. (We will come back to her for a Pirates of the Caribbean book.) In the novels, Han is a tougher, more cynical character. He’s been wounded repeatedly and has no idealism to lose. He’s funny but in a bitter way. In the movie, he’s more upbeat, lighter, and gradually loses that. By the end he’s embittered but still eager to try. So which is Han? Easy. Both are for their format. The EU Han is set up in this book and it’s important to stress he’s a different character from movie Han. He’s a general. He’s a warrior for the galaxy. He’ll go on to fight the Empire to the very end followed by the Yuuzhan Vong. He’s cynical, yes, but in a way a general must be. Movie Han is lighter, goofier, and really only in it for the people he likes. He’s selfish, vain, proud. That’s who shows up in Solo. The novels don’t really set up Movie Han though they worked just fine in the absence of another option. The movie sets that guy up. That’s who I wanted to see. The books do several things better but ultimately it’s canon that wins. 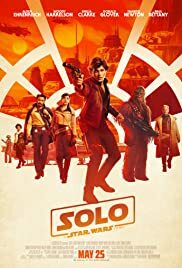 So given that I vote for Solo as the better prelude, should you avoid the Trilogy? Hell no. The trilogy holds up as a fun, labyrinthine journey through the Star Wars crime world. There’s tons of great cameos by figures throughout the EU. I also like a different angle on Han. He’s a more serious, real character here and I dug that. The books are still widely available, including in a gorgeous HC from Barnes and Noble. Check them out.